This meditation will use a Pure Grace Heart with four Herkimer Diamonds and four Rose Hearts of Light. Please use the image below as a focus. This meditation will be repeated on New Years day and the 6th of January 2012. 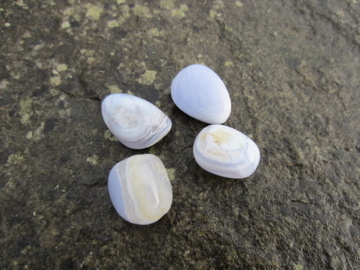 Very windy day here in Orkney but managed to plant these beautiful Blue Lace Agate crystals. There will be three special meditations during the Christmas festivities, on Christmas Eve 24th December through 3pm GMT, Christmas Day 25th December through 12pm GMT and Boxing Day 26th December through 3pm GMT. These meditations will use Chrysocolla and Blue Lace Agate in connection with a Pure Grace Heart. Please use the image below as a positive visualisation. We hope you can join us where ever you are across the globe for one or all of these special meditations and may peace and strength of heart be with you this Christmas. This meditation will use malachite, rose quartz and celestite crystals in connection with a Pure Grace Heart. Please use the image of a Pure Grace Heart as a positive focus. Thank you for your connection. Jennifer Mole and I had an amazing trip to Fortingall in central Scotland recently, with many crystal plantings achieved and many moving experiences. Some of the sites visited were the ancient Yew Tree in the church yard in Fortingall, standing stones in the area, the Praying Hands of Mary and Ben Lawers. We planted aura crystals in various combinations, Pure Grace Selenite Hearts in connection with blue lace agate and chrysoc0lla and two Sacred Matrix sets as well as a Pure Grace Heart for coastal waters from the harbour wall in Stonehaven, on the way there from Aberdeen. I spoke to someone recently who, having been very skeptical about the potential of crystals, had started wearing a programmed amethyst to protect them from negative environmental energies. After only a few days, they had literally had a leap of faith, as they felt so much more energised and positive, having been freed from the effects of the negative energy soup of the urban environment in which they were living. They are now keen to plant programmed pyrite to nearby pylons and mobile phone masts and to look at other ways of using crystals to positive environmental effect. This is what Crystal Earthworks is all about - giving people the opportunity, education and empowerment to use crystals in an informed way to make a positive difference to their health and the health of others and to begin to heal our energy challenged planet. Took this photo of the hills in Orkney from the garden yesterday - looks a bit different now - in fact not even visible as yet another stormy band of weather hits the Isles! Stayed in a supposedly haunted Manor House at the weekend and felt prompted to take the crystals for Release. Our first night there felt quite strange and nobody slept well. Planted the site with the crystals at around 8pm the next night and had an image of a child returning to the Light with its parents on either side. The whole atmosphere in our room and the older part of the building felt far more flowing after the planting as if an energy of tension and frustration had been released and everyone slept well that night. I have subsequently read that a child has been heard crying in room six 6, (we stayed in room 7) and a woman seemingly searching for her son, has been heard and seen by staff at various times upstairs in the house. Customers have also smelt the scent of tobacco in room 4 and had a feeling of being watched or followed. 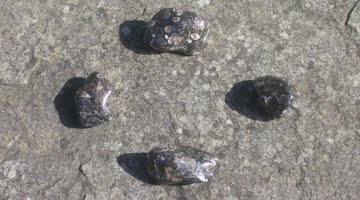 These meditations will use the snow quartz cairn in the garden at Old Nisthouse, Harray, Orkney, surrounded by four Agate Turritella shown below.